2012 Presidential candidate Mitt Romney took it on the chin when he dared to state during the last presidential election cycle that corporations are people. While the Enterprise Engagement Alliance is unequivocally non-partisan, since engagement can benefit people of all parties, it is fair to say that great companies are indeed people – perhaps just not in the way Mr. Romney meant. Yes, great companies embrace a culture that emphasizes success through people, not from or in spite of them. Organizations focused on success through people can in a way be accused of greed, because it turns out that businesses that foster the proactive involvement of all their relevant constituents do generally perform better than their competitors financially. And the founders and leaders of these companies certainly understand that the brand is nothing but the sum total of the people charged with representing it. Buy a half-dozen eggs from The Country Hen, at about double the price of conventional eggs, and you’ll find a newsletter in your carton singing the praises of individual employees. AT&T, in a recent ad, says: “The hardware is nice. Your happiness, way nicer. Our employees put our customers first in everything we do.” The car floormat maker Weather Tech advertises that all of its products are made in the U.S. and extols the value of its workers. On the negative side, the American Airlines brand is currently taking a beating because of worsening labor relations. Its pilots have gone public with complaints that the airline’s brand is suffering because “of a return to a toxic culture,” as reported in a recent Bloomberg.com article. When more organizations understand that their brands rise and fall on the ability of their people to deliver the brand promise, it will become clearer – and hopefully more universally accepted and defined in the best possible light – that companies are indeed people. 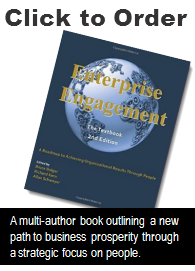 Learn how to implement Enterprise Engagement strategies at your own organization by attending Engagement University April 25-27, 2016 at the Renaissance Orlando at SeaWorld, part of Engagement World.